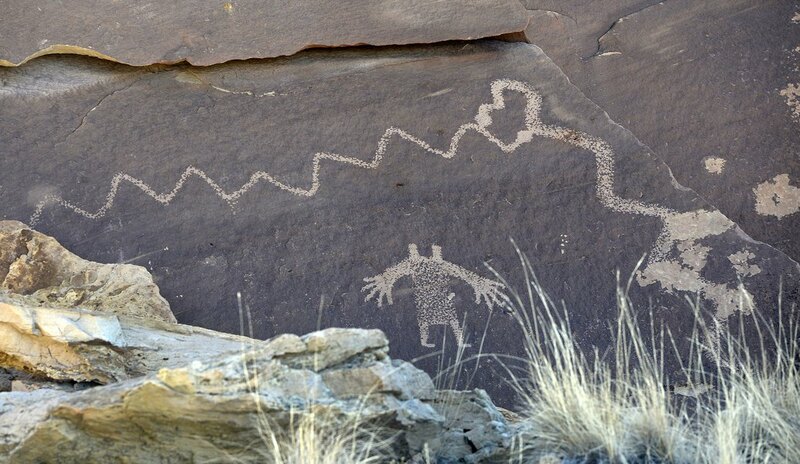 (Al Hartmann | Tribune file ) Fremont petroglyph of snake and figure called "Cowboy Secret" tucked beneath jumbled sandstone caprock in the Molen Reef area of the San Rafael Swell. The Bureau of Land Management recently blocked at least 14 staff archaeologists from presenting their views at a scientific conference on managing archaeologic riches on public lands. At a time when archaeological sites are a growing flashpoint in the debate over public lands, the Bureau of Land Management blocked at least 14 staff archaeologists and other specialists, including some from Utah, from attending a major scientific conference last month, a new report says. But a few days before the conference, BLM supervisors decided against sending the staffers, many of whom are based in Western states where the agency manages millions of acres that contain countless sites and artifacts left by ancient American Indian civilizations. In response, conference organizers canceled that symposium, which was to be led by the BLM’s top cultural resources official Byron Loosle, formerly with the agency’s Utah state office. The Post cited federal employment databases to report that 17 of the scheduled SAA presenters were BLM employees. The agency’s move to keep them from the conference is seen by some as another example of how the Interior Department under President Donald Trump’s leadership is curbing federal researchers’ ability to engage with the public, particularly in areas that touch on energy development. The BLM, in a written statement, framed its decision as a cost-saving move. “After reviewing the potential travel and other costs associated with attending the Society for American Archaeology’s national conference, the BLM authorized attendance by three BLM archaeologists,” the statement said. The agency declined to name the three staffers who did attend, but a list of those scheduled to present, available on the SAA conference program, includes Diana Barg and Nathan Thomas of the Utah state office; Jamie Palmer of the Cedar City field office; and Nicole Lohman of the Price field office. They were to deliver 15-minute presentations during a four-hour symposium on crucial issues involving the management of archaeological resources on public lands. Thomas and Barg, for example, were to present on how the agency was confronting looting, which has long plagued archaeological sites in Utah and prompted investigations and prosecutions targeting San Juan County residents. “Looting issues can be exacerbated by the limited on-the-ground resources of federal agencies that manage millions of acres,” they wrote in an abstract of their presentation. Thomas is the state office’s cultural preservation officer and Barg manages the BLM’s Utah collections, including the several thousand artifacts seized in Operation Cerberus, the controversial 2009 crackdown on illegal artifacts trafficking centered in Blanding. While the symposium was to be a small part of the five-day conference, SAA officials were disappointed with the BLM for disallowing its staffers from presenting. “Archaeologists from around the world were deprived of a symposium filled with valuable information about the tough issues facing land-managing agencies, and from learning about BLM’s innovative solutions to handling conflicts with development, using data to inform future land management decisions, and working with Native American communities to protect their extensive cultural heritage from looting and other threats,” said SAA President Susan Chandler. Lohman’s presentation was to explore the “tricky balancing” of multiple laws and policies the BLM has to manage while leasing public lands in areas rich in archaeology. She was going to discuss a BLM lease auction in 2017, when it offered areas in Emery County that hold hidden treasures of Fremont rock art. Palmer was to talk about how the National Historic Preservation Act (NHPA) fails to protect cultural resources valued by tribes during the permitting of several major energy projects. Loosle’s presentation was to argue for better planning ahead of development, as opposed to the reliance on mitigation once drilling or other work has already resulted in “adverse effects” to cultural sites. According to the SAA, federal archaeologists have attended the conference regularly since agencies began hiring those experts under the NHPA, passed in 1966. One BLM employee, who requested anonymity for fear of retribution, told The Post that staffers vetted their conference attendance through the BLM director’s office for approval during the Obama and Trump administrations. Under both administrations, budget was a consideration, but under Trump, “individual events themselves and topics to be covered got more scrutiny,” the employee told the paper. Critics in the conservation community believe the action illustrates the agency’s tendency to promote energy development without adequate regard for other resources and values.